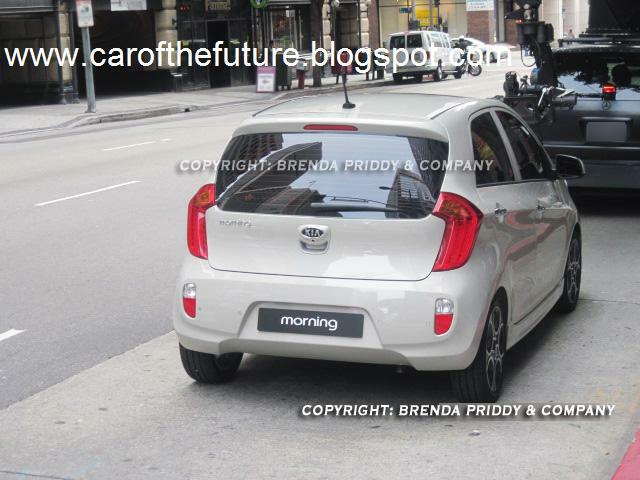 Our spies have caught up with the forthcoming Kia Picanto (Morning in South Korea and Latin America) completely free of camouflage while on a commercial in south-western United States. 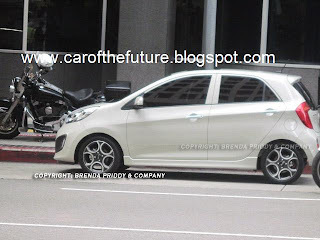 The car will be longer and wider than the outgoing model, while retaining the same height. 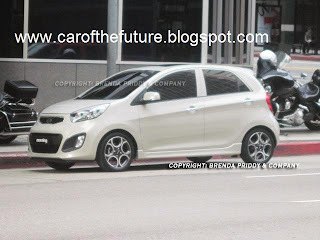 Like previous spy photos and sketches reveal, the new Picanto will look like a miniature Venga; muscular shoulders with rising window line, lower roofline, larger wheel arches, large headlights with oversized foglamps housings and a protruding bumper will all contribute to a sporty, lean look. 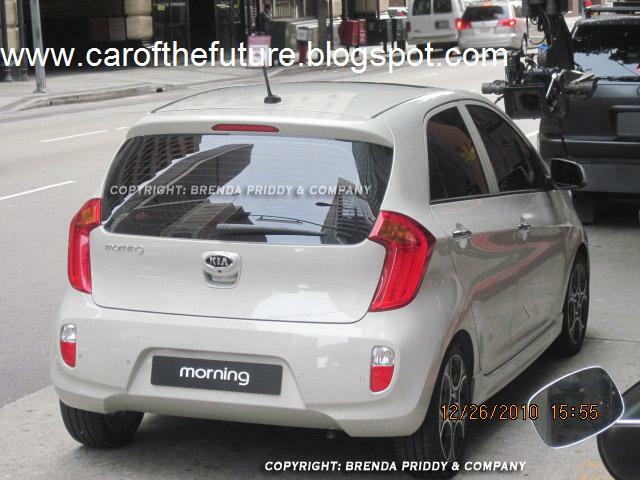 Kia's trademark "tiger nose" will mimic that of the Soul. 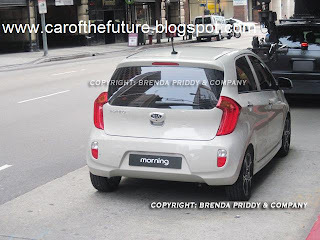 At the rear, LED-esque tail-lights that imitate the number seven jut while the Kia badge, which doubles up as a door handle to give access to the boot, dominates the bootlid. Reversing lights and reflectors are now positioned on the edges of the rear bumper. 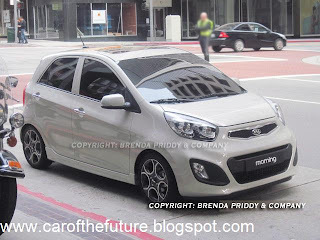 On the inside, the Picanto is likely to bare resemblance to the Venga and Soul and will sport substantially better interior materials and more space as engineers use every centimetre of space available. While the 5dr (pictured here) is the only body-style currently available, KIA is reported into looking at a 3dr variant to help lower the base price. Expect the Picanto to be even more practical than the outgoing model. Hyundai-KIA’s all-new 1.0 litre petrol engine will live under the bonnet, alongside a 3-cylinder 1.1 CRDi and a naturally-aspirated 1.2 litre petrol. A turbocharged 1.2 litre petrol engine, developing anything upto 150bhp may be in the pipeline and is likely to replace the regular 1.2 litre. Like the current line-up, value for money is key here. So we expect electric front windows, air-conditioning, x4 airbags, MP3 compatible radio/CD player, and electrically adjustable door mirrors to be standard. South Korean models are likely to feature luxuries like electric sunroof, auto-dimming rear-view mirror w/reversing camera, heated front seats, chrome exterior door handles, climate control, electric folding door mirrors, and rear electric windows. The all-new Picanto will premier at the Geneva motor show in March, before going on sale in Spring. We anticipate a modest price increase compared to the outgoing model; an entry-level price of £7k (€8,000) is suggested by many. Just simply awesome and more specious. Just love it.